There she sits, motionless, throughout the day, watching golfers launch their balls onto the verdant fairways at Deepdale Golf Club. A winsome blonde with delicate features, this diminutive diva wears a lacy, low-cut blouse and a billowy scarlet skirt. In one hand she holds a slatted fan, in the other, a white handkerchief... summers can be steamy on Long Island's north shore. She is not, however, a lady of leisure. 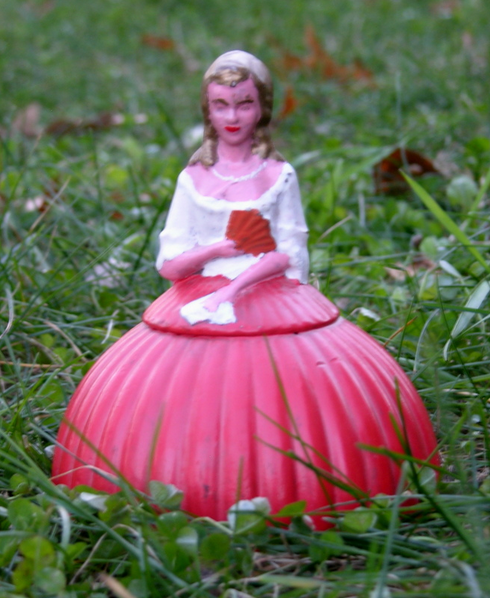 Despite her fanciful garb the girl has a job to do; implausible as it may seem, she is a tee marker. These days, golf courses generally mark their tees with uninspired spheres of plastic, in a small range of colors to designate degree of difficulty. This makes total sense in a modern world where whimsy must give way to practicality in order to ensure sustainability... making the little lady in the flouncy red skirt, all the more seductive. A couple of weeks ago, one of these very distinctive tee markers, was on the auction block at Green Jacket Auctions, a company specialized in the authentication, appraisal and auctioning of golf antiques and collectibles. With a starting bid of $50.00, Lot 426: Ladies Tee Marker from Deepdale Golf Club, sold for just $69.00 at the 2014 Winter Holiday Auction. I discovered the auction after it had closed, much to my dismay, but will be on the lookout for this... and other... unique golf collectibles in the future. The next Green Jacket Auction takes place from March 25, to April 11. In the meantime catch founders Ryan Carey and Bob Zefian on Back9Network, where the original series, Golf Treasures, highlights their experiences in the fascinating world of golf memorabilia.